What a rebound in the stock market! The PowerShares QQQ ETF (NASDAQ:QQQ) surged 2.6%, the Dow Jones jumped almost 500 points and for once, small caps led the rally rather than the decline. 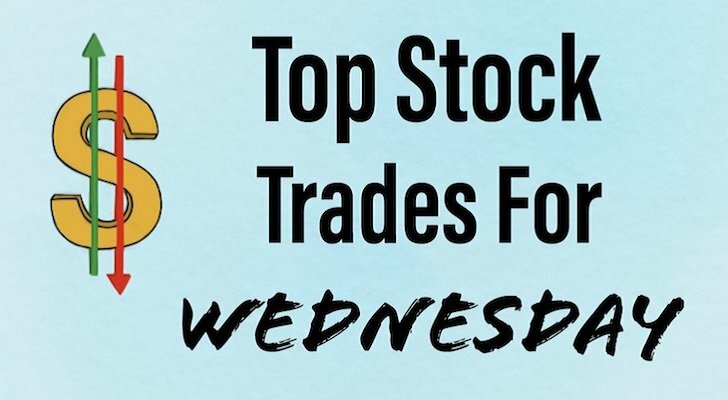 That sets up a ton of must-see stock charts and top stock trades for tomorrow. After reaffirming its guidance and laying out expectations for strong growth in 2019, shares of Adobe Systems (NASDAQ:ADBE) soared Tuesday. Shares rose 9% and were strong all day, even when investors were unsure of whether to trust the market’s rebound. Those who bought on the 200-day are both smart and a bit richer today. The stock easily jumped through its 20-day moving average and I’m going to speculate that it’s not the 50-day slowing it down at the moment. 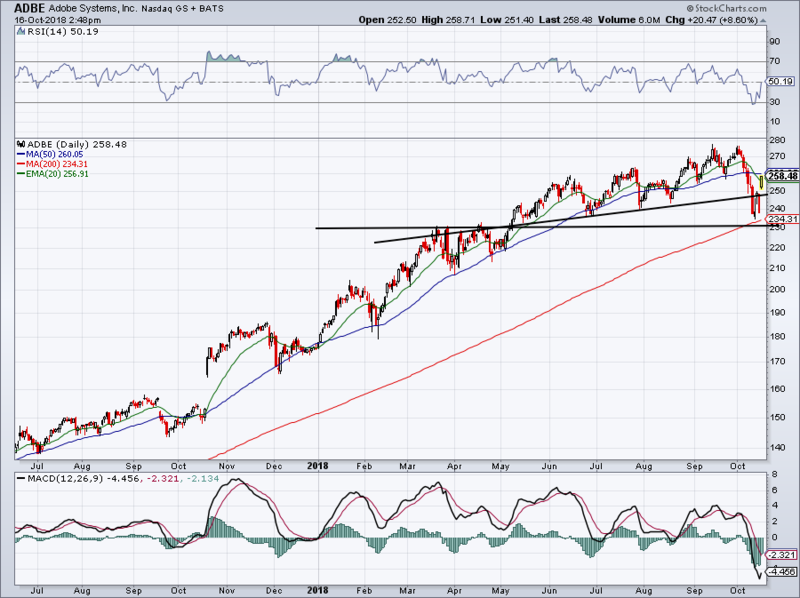 If the market holds up, Adobe should easily hurdle the $260 level. I wouldn’t let shares get below $250 now though if I were long and the ultimate line in the sand is near ~$230. Below that and Adobe is in trouble. If the broader market plays ball and rallies in Q4, look for new highs in ADBE. Morgan Stanley (NYSE:MS) beat on earnings estimates and saw a 6% rebound as a result. 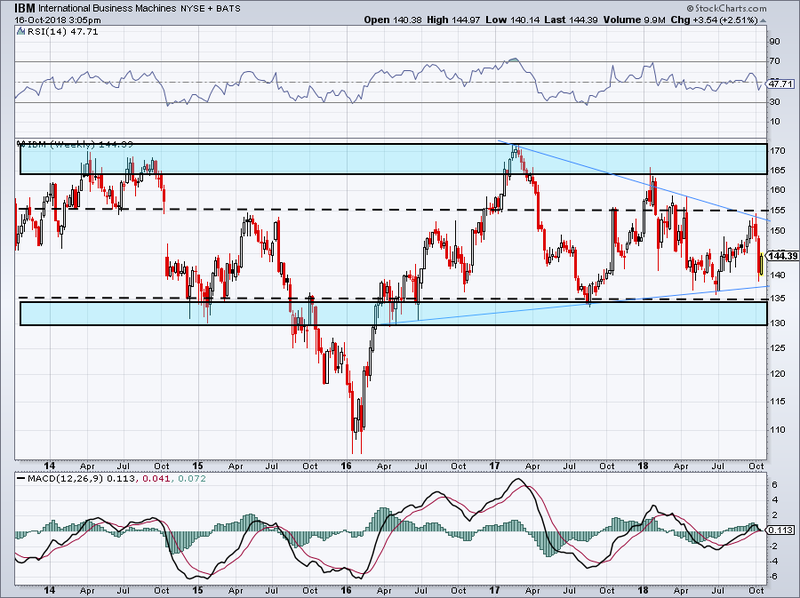 Will shares find resistance at $46? That much is not yet clear, although the declining 20-day moving average and previous support are at this level. 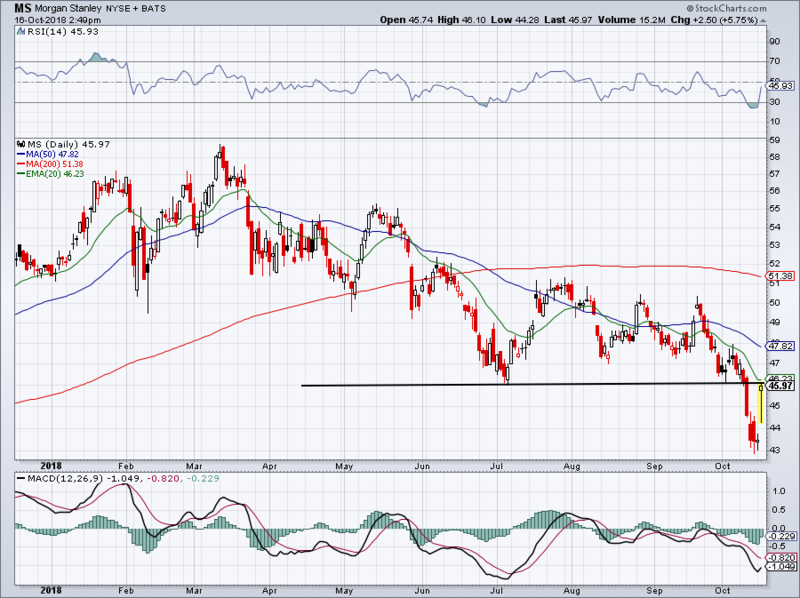 While the bounce off $43 is impressive, I don’t like the setup in MS stock as much as I do others. For instance, Goldman Sachs (NYSE:GS) and Bank of America (NYSE:BAC) have better setups, while JPMorgan (NYSE:JPM) has a pretty clear-cut layout as well. A miss on revenue expectations and comp-store sales knocked Domino’s Pizza (NYSE:DPZ) lower on Tuesday by more than 4.5%. However, this growth stock is now sitting on a solid risk/reward support zone. With support in this $255 area and the 200-day just below, bulls can go long DPZ and bail should it close below the 200-day moving average. Last week, we highlighted just how darn well Canopy Growth Corp (NYSE:CGC) was holding up amid the brutal declines in the stock market. The stock continues to trade well, although I don’t like to buy big movers into events. On Wednesday, recreational pot will be legalized in Canada. Whether that’s priced in already or provides a big jolt to CGC, I’m not sure. 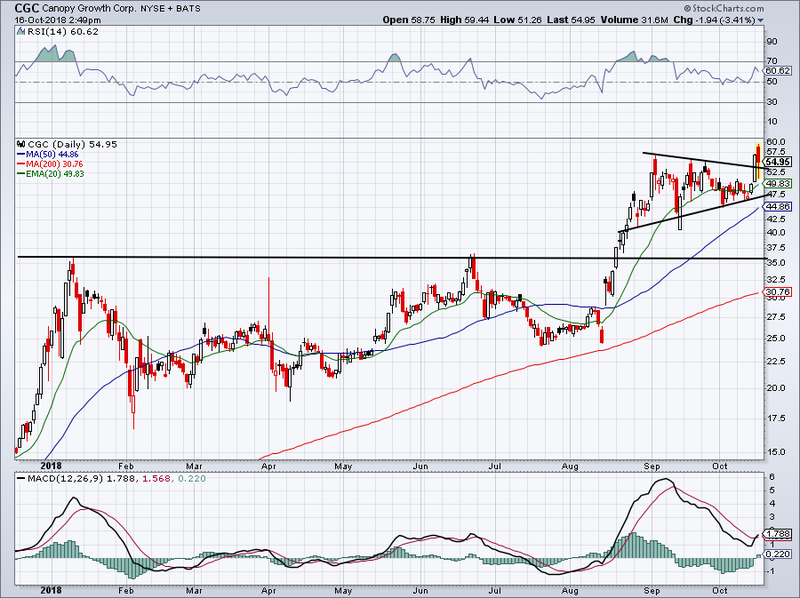 What I do know is that CGC is holding up above short-term downtrend resistance. If bulls are itching to get into this name, they can do so, so long as CGC is above this mark and the 20-day moving average. I would feel better about it over the $55 to $56 level or on a deep decline down to $36, though. International Business Machines (NYSE:IBM) will report earnings after the close on Tuesday. The stock has been dead money for a while now that’s why — along with General Electric (NYSE:GE) and Snap (NYSE:SNAP) — I named it one of the 3 stocks to avoid this summer. On the charts, we can see IBM consolidating between our two trend lines (blue lines). There’s long-term resistance between $165 and $170 and long-term support between $130 and $135. I need a break of some sort. Either a breakdown into support, where it holds and doesn’t go below $130 or a breakout over $155. Without either one, IBM can continue to chop around. Over the last few years though, Q4 has been kind to IBM. Let’s see if management can draw a repeat. Bret Kenwell is the manager and author of Future Blue Chips and is on Twitter @BretKenwell. As of this writing, Bret Kenwell is long BAC and JPM. Article printed from InvestorPlace Media, https://investorplace.com/2018/10/5-must-see-stock-charts-cgc-adbe-ms-dpz-ibm/.